19:1 The second lot came out for Simeon, for the tribe of the people of Simeon, according to their clans, and their inheritance was in the midst of the inheritance of the people of Judah. 2 And they had for their inheritance Beersheba, Sheba, Moladah, 3 Hazar-shual, Balah, Ezem, 4 Eltolad, Bethul, Hormah, 5 Ziklag, Beth-marcaboth, Hazar-susah, 6 Beth-lebaoth, and Sharuhen—thirteen cities with their villages; 7 Ain, Rimmon, Ether, and Ashan—four cities with their villages, 8 together with all the villages around these cities as far as Baalath-beer, Ramah of the Negeb. 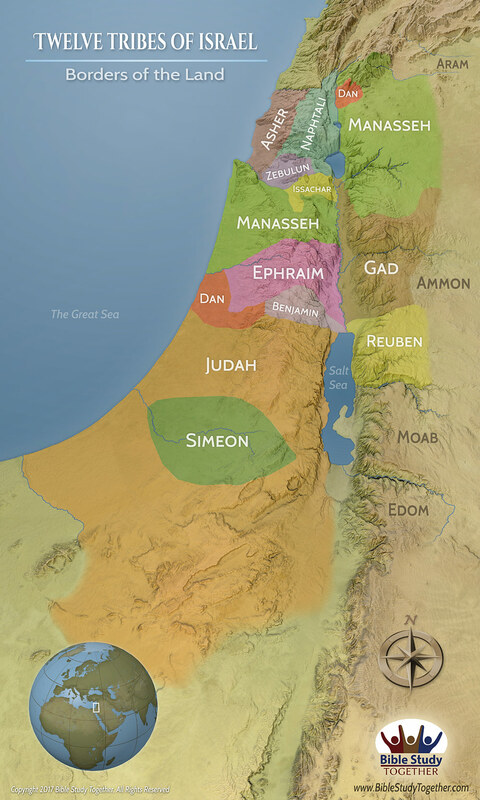 This was the inheritance of the tribe of the people of Simeon according to their clans. 9 The inheritance of the people of Simeon formed part of the territory of the people of Judah. Because the portion of the people of Judah was too large for them, the people of Simeon obtained an inheritance in the midst of their inheritance. 10 The third lot came up for the people of Zebulun, according to their clans. And the territory of their inheritance reached as far as Sarid. 11 Then their boundary goes up westward and on to Mareal and touches Dabbesheth, then the brook that is east of Jokneam. 12 From Sarid it goes in the other direction eastward toward the sunrise to the boundary of Chisloth-tabor. From there it goes to Daberath, then up to Japhia. 13 From there it passes along on the east toward the sunrise to Gath-hepher, to Eth-kazin, and going on to Rimmon it bends toward Neah, 14 then on the north the boundary turns about to Hannathon, and it ends at the Valley of Iphtahel; 15 and Kattath, Nahalal, Shimron, Idalah, and Bethlehem—twelve cities with their villages. 16 This is the inheritance of the people of Zebulun, according to their clans—these cities with their villages. 17 The fourth lot came out for Issachar, for the people of Issachar, according to their clans. 18 Their territory included Jezreel, Chesulloth, Shunem, 19 Hapharaim, Shion, Anaharath, 20 Rabbith, Kishion, Ebez, 21 Remeth, En-gannim, En-haddah, Beth-pazzez. 22 The boundary also touches Tabor, Shahazumah, and Beth-shemesh, and its boundary ends at the Jordan—sixteen cities with their villages. 23 This is the inheritance of the tribe of the people of Issachar, according to their clans—the cities with their villages. 24 The fifth lot came out for the tribe of the people of Asher according to their clans. 25 Their territory included Helkath, Hali, Beten, Achshaph, 26 Allammelech, Amad, and Mishal. On the west it touches Carmel and Shihor-libnath, 27 then it turns eastward, it goes to Beth-dagon, and touches Zebulun and the Valley of Iphtahel northward to Beth-emek and Neiel. Then it continues in the north to Cabul, 28 Ebron, Rehob, Hammon, Kanah, as far as Sidon the Great. 29 Then the boundary turns to Ramah, reaching to the fortified city of Tyre. Then the boundary turns to Hosah, and it ends at the sea; Mahalab, Achzib, 30 Ummah, Aphek and Rehob—twenty-two cities with their villages. 31 This is the inheritance of the tribe of the people of Asher according to their clans—these cities with their villages. 1And the second lot came forth to Simeon, even for the tribe of the children of Simeon according to their families: and their inheritance was within the inheritance of the children of Judah.2And they had in their inheritance Beersheba, and Sheba, and Moladah,3And Hazarshual, and Balah, and Azem,4And Eltolad, and Bethul, and Hormah,5And Ziklag, and Bethmarcaboth, and Hazarsusah,6And Bethlebaoth, and Sharuhen; thirteen cities and their villages:7Ain, Remmon, and Ether, and Ashan; four cities and their villages:8And all the villages that were round about these cities to Baalathbeer, Ramath of the south. This is the inheritance of the tribe of the children of Simeon according to their families.9Out of the portion of the children of Judah was the inheritance of the children of Simeon: for the part of the children of Judah was too much for them: therefore the children of Simeon had their inheritance within the inheritance of them.10And the third lot came up for the children of Zebulun according to their families: and the border of their inheritance was unto Sarid:11And their border went up toward the sea, and Maralah, and reached to Dabbasheth, and reached to the river that is before Jokneam;12And turned from Sarid eastward toward the sunrising unto the border of Chislothtabor, and then goeth out to Daberath, and goeth up to Japhia.13And from thence passeth on along on the east to Gittahhepher, to Ittahkazin, and goeth out to Remmonmethoar to Neah;14And the border compasseth it on the north side to Hannathon: and the outgoings thereof are in the valley of Jiphthahel:15And Kattath, and Nahallal, and Shimron, and Idalah, and Bethlehem: twelve cities with their villages.16This is the inheritance of the children of Zebulun according to their families, these cities with their villages.17And the fourth lot came out to Issachar, for the children of Issachar according to their families.18And their border was toward Jezreel, and Chesulloth, and Shunem,19And Haphraim, and Shihon, and Anaharath,20And Rabbith, and Kishion, and Abez,21And Remeth, and Engannim, and Enhaddah, and Bethpazzez;22And the coast reacheth to Tabor, and Shahazimah, and Bethshemesh; and the outgoings of their border were at Jordan: sixteen cities with their villages.23This is the inheritance of the tribe of the children of Issachar according to their families, the cities and their villages.24And the fifth lot came out for the tribe of the children of Asher according to their families.25And their border was Helkath, and Hali, and Beten, and Achshaph,26And Alammelech, and Amad, and Misheal; and reacheth to Carmel westward, and to Shihorlibnath;27And turneth toward the sunrising to Bethdagon, and reacheth to Zebulun, and to the valley of Jiphthahel toward the north side of Bethemek, and Neiel, and goeth out to Cabul on the left hand,28And Hebron, and Rehob, and Hammon, and Kanah, even unto great Zidon;29And then the coast turneth to Ramah, and to the strong city Tyre; and the coast turneth to Hosah; and the outgoings thereof are at the sea from the coast to Achzib:30Ummah also, and Aphek, and Rehob: twenty and two cities with their villages.31This is the inheritance of the tribe of the children of Asher according to their families, these cities with their villages. What promise to Abraham was fulfilled in today’s reading? How can you use what God has entrusted to you to serve Him? How can you be a shining light in the place that God has given you to live? Talk to someone about the spiritual boundaries that God has put in place for you.